The Luna lamp by Acorn Studio was inspired by the moon, and is currently available via an Indiegogo campaign. Ever look up at the full moon on a clear night and wish you could bring it straight into your home? Well, the next best thing is now available, and it's called Luna. 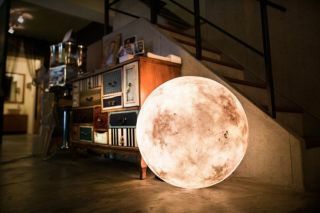 The spherical Luna lamp looks strikingly like the real moon, so it's immediate eye candy for night-sky enthusiasts (or really for just about anyone). Lit from within, it radiates a diffuse, soft-yellow glow, and the surface is covered in a patchy light-and-dark pattern, just like the one that's created by the maria (old volcanic material) on the real lunar surface. The Indiegogo page advertising the lamp features an adorable video starring a miniature astronaut and a Godzilla monster who encounter each other on the surface of the moon — or rather, the Luna lamp. In addition to being advertised as a piece of art, Acorn Studios touts the Luna's durability, so it can be put on the floor and even be played with. The lamp is made from fiberglass and latex — according to the Indiegogo page, it is water-resistant, heat-resistant and "crashworthy." The lamp is certainly inspiring, and the company doesn't underestimate just how beautiful it is. In fact, from this description, it almost sounds like the Luna lamp could basically solve all every problem in the owner's life: "Luna is a design décor that turns your home into a magical world. It's a lamp that lightens up your favorite reading corner. It's your companion who embraces you with endless tenderness and warmth late at night when things in life just don't go smoothly. Your mood varies every day, but Luna stays the same for you. You deserve a better way of living with Luna." The cost of the lamp may be high for some people, especially because it would be great to get four or five of these and fill a room with them. Buying via the Indiegogo page gets you a 20 percent discount on most sizes of the lamp, so if you're serious about buying, now might be the time. The campaign ends Oct. 31. This Sunday will be a particularly awesome night for moon watching: The lunar eclipse will also be a supermoon and a Harvest Moon. Check out our full coverage of the event right here.